Nepalese paper artisans hand-craft Lokta paper out of fibers from the bark of the Lokta bush. 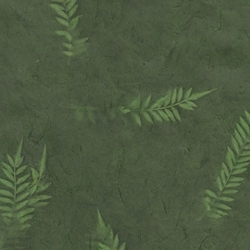 Real fern leaves are placed on the dark green paper and then exposed to the sun where the color around the leaves washes out. This natural green Lokta Paper features subtle fiber inclusions, adding handmade beauty to whatever you create with it.